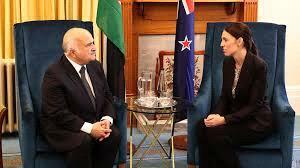 AMMONNEWS - Deputizing for His Majesty King Abdullah II, HRH Prince Hassan bin Talal, on Friday, met with New Zealand Governor-General Patsy Reddy. During the meeting, the Prince passed on King Abdullah's condolences and the Jordanian people over the victims of the terror attacks, expressing Jordan's condemnation of such terror crime. Prince Hassan stressed the importance of fighting terrorism and promoting the values of brotherhood and coexistence. The governor-general commended Jordan's role under the leadership of His Majesty the King in supporting her country in such hard conditions. Prince Hassan, HRH Princess Rahma bint Hassan, Foreign Ministry Secretary General Zaid Lozi and the accompanying delegation participated at a pause for two minutes of silence to commemorate the 50 victims of the Christchurch mosque shootings.